An engine ‘runs away’ when it revs uncontrollably and often extremely quickly. 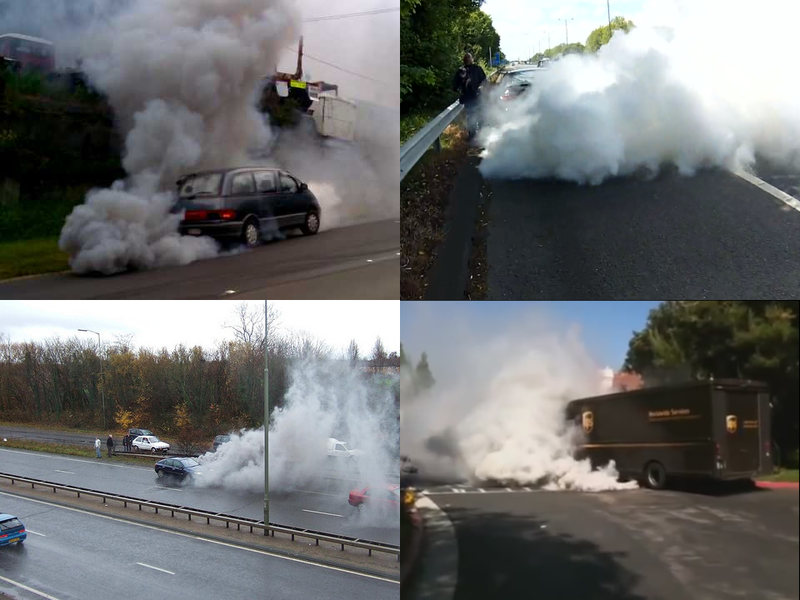 This could be caused by a few things but in all cases unregulated fuel and air are entering the combustion chamber, effectively causing the engine to go crazy without you telling it to. To stop it is simple; cut the fuel/air/ignition supply. If one of these is missing combustion can’t occur. On a runaway diesel however, there can be a few problems. Why does it happen to diesels? Diesel engines will run on a lot of fuels. After diesel, one of their favourite fuels is oil, and they’re not picky about what type. If oil and air enter a diesel engine it will combust, albeit with a puff of smoke out of the exhaust, hence the nickname ‘oil burner’. A lot of diesels are turbocharged, and turbos are lubricated by oil. If a seal on a turbo fails, high pressure oil can be sent into the engine - this is where the runaway starts. How will I know it’s happening? The engine will start running off of it’s oil supply. You can take the key out and it will still be running at 8000 rpm (this is a diesel with a 4500 rpm redline remember). You may get out of the car and run away yourself (and who can blame you) and turn around to see something like the cars above. That’s right, none of these cars are on fire - yet. You’ll stand by watching as your car covers 6 lanes of the motorway in smoke, waving your key at passers by and mouthing "I’VE TAKEN THE KEY OUT" trying to assure them that you did the obvious thing and took the key out, but somehow your car is still bellowing smoke. If you are incredibly brave you can do as this man does. The video starts a minute in and you’ll know when the runaway occurs… to some of your ears it will sound like VTEC kicking in shudders. He suffocates the intake, preventing air from entering the engine. Aside from some damage to the compressor wheel on the turbo caused by the plastic used, the engine was saved (I will point out this runaway was NOT caused by a worn out turbo seal - there are other ways for the oil to enter the engine that I will discuss below). If you can create a good seal against the intake using a bunched up rag or a piece of flexible plastic, and there are no leaks in your intake system, then this will work almost every time. But as I said, you have to have testes the size of Jupiter to try this. The easier and safer way of stopping a runaway engine is to stall it. Unfortunately it isn’t as reliable as the first method, but is always a good place to start. With the car at a standstill, put the handbrake VERY on. Then stand on the brake pedal as hard as you can. Put your foot on the clutch and put the car in top gear (1st, 2nd and reverse won’t do it). Then dump the clutch, let your foot slip off the side if you have to - the less gentle you are with it the better. Hopefully this will stall the engine. If it doesn’t work the first time try it a couple more times before moving on to a different method. I’ll point out the importance of your footwork here: not hard enough on the brakes and you’ll launch a smokey diesel down the road at a million miles an hour with your trousers full of poo. Too gentle with the clutch and it will slip and burn out and you’ll have to add a clutch to the list of new parts your car will need. Unfortunately this method is not 100% reliable. If a particularly large diesel is running away at an incredibly high speed it may be producing too much torque and will overcome the friction of the clutch, and no matter how hard you try you cannot stall it. This is more common on lorries and trucks than it is on road cars with 2 litre engines however, but if a clutch is worn out already don’t expect it to be able to take abuse of this nature. Oh you drive an automatic? Run. Run far away, there’s nothing you can do (except method 1 and 3). The final method is my favourite as it is much more reliable than either of the other two and you don’t have to put your fingers anywhere you don’t want them. You do however have to carry a fire extinguisher around with you. That’s correct a CO2 fire extinguisher sprayed into the intake of a car will suffocate it of oxygen and cause it to stop without damaging any internals or fingers. The only real disadvantage of this is that you need to know where your engine’s intake is so you can find it in a panic whilst everything is covered in smoke, although the same can be said for the rag method. However if you’re feeling particularly engineery you can plumb in a racing fire extinguisher system that can be activated from inside the cabin or outside the car which will empty a fire extinguisher into the intake. Nice and safe. Will it happen to my car? Some modern cars actually do come with a throttle plate to help improve the emissions and also allow DPFs to do their job. If this is the case then it is possible for a safety feature to be fitted which will close the throttle in the event of a runaway. That said just because your car has a DPF doesn’t mean it will have this safety feature. Aside from a failed turbo seal, oil can enter the cylinders in other ways. If the piston rings are worn out then it’s possible for the oil to enter the cylinder from the crankcase. Obviously this can happen to any diesel, turbo or not. The same methods of stopping it apply though, although with less spinny compressor wheels to eat your fingers off. Less likely to cause runaway but not impossible is for the valve stem seals to wear out. However for this to cause runaway you’d need a majority of the seals to be worn out and pressurised air in the cam cover. If you have that then runaway is just the beginning of your problems. The only thing left to do is preventative maintenance. Keep to your oil change intervals, check the condition of your turbo at a similar interval to your cambelt and NEVER overfill the engine oil. That will just encourage oil to seep past the piston rings. What if I can’t stop it? Run. Best case scenario the engine will burn though it’s oil and then seize. Worst case you’ll have connecting rods exiting the engine block at kneecap-shattering speeds. Both result in a new engine at least, which is why it’s important to at least attempt to stop it. Here are a few links to Youtube videos of runaway. In almost all of them the owners are just standing next to their cars wondering what it is doing. Don’t be one of them. Thank you. Freelander runaway - the key was not removed so at the end of the video you see the car stops running away and returns to normal idle with no smoke. The guy’s comment at the end is accurate also. If anyone disagrees with anything I’ve said then please comment so we can discuss it, I’ll be happy to amend anything that is incorrect. Thanks for reading!